Millions of people live and work in the towns and cities surrounding the Gulf of Maine in Massachusetts, New Hampshire, Maine, New Brunswick, and Nova Scotia. Their economic prosperity and quality of life are tied directly and indirectly to the region’s ocean and coastal resources. Fishermen, beachside hotel owners, whale watch operators, and offshore wind investors are only a few examples of the many people whose livelihoods depend on continued access to and sustainable use of the Gulf’s natural capital. Achieving sustainability is especially important and challenging as people use the ocean in a growing multitude of ways and as climatic conditions change. 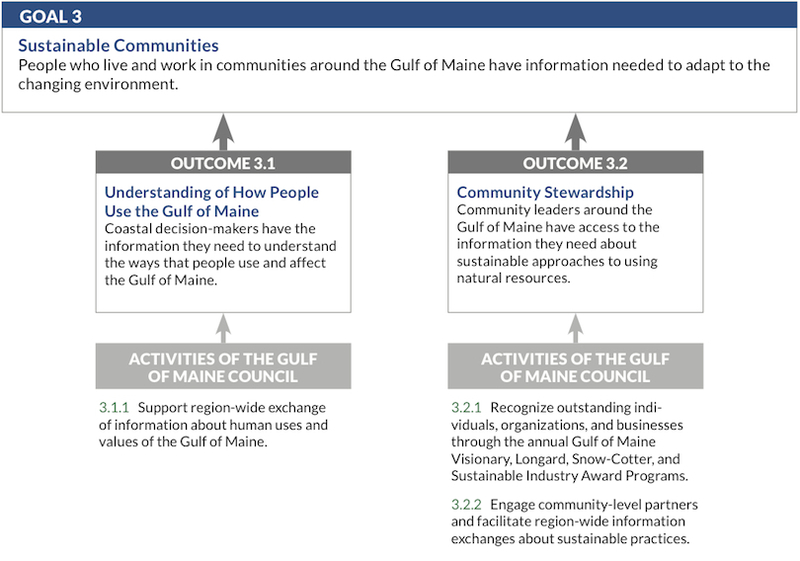 Community members and coastal decision-makers in the states and provinces bordering the Gulf of Maine require accurate, relevant, and easy-to-use information in order to adapt successfully to these changes. Goal 3 activities address the region’s need for data, information, and partnerships to adapt to the changing environment.